Day of rest. Went to church. We had the Primary children do a presentation during the Sacrament meeting. The lesson in Sunday school was on the Second Coming. The lesson in the Elder's Quorum was on baptism. When I got home, I was tired and took a nap. A.M. Total of 12. Ran with Mike, we did 0.75 in 4:01. Then with the kids. Benjamin ran 3, Jenny and Julia 2, Joseph 1, and Jacob 0.5. A.M. Total of 12. Ran with Mike. We did 0.75 in 3:57. Then with the kids. Benjamin ran 3, Jenny and Julia 2, Joseph 1, and Jacob 0.5. A.M. Ran with Mike. We did a pickup for 0.25 in 78. Then with the kids. Benjamin did 3, Jenny and Julia 2, Joseph 1, and Jacob 0.25. A.M. Earn Your Turkey 4 miler - 22:25, 9th place. It was around 10 F at thes start. As far as I remmeber, last time I raced in temperatures that cold was cross-country 3 K 1986 in Moscow, and I am not even sure if it was that cold. I remember my time too - 11:08 for the 3 K. I have trained enough in cold weather to know, however, that there is a world of difference between 25 F and 10 F for performance. Something happens in between. In 25 F you lose maybe 5 seconds a mile. In 10 F you lose a lot more. My original plan was to try to maintain 5:20s, but with the conditions it was out of the window. So I just ran. The mile markers were placed by the GPS according to Hawk, and sure enough they were in the wrong spots. Back in the old days Hawk used the wheel, and he would get them right expect he would habitually confuse marker 1 and 3 as they were too close together, but far apart enough where you would definitely notice a dog-slow third mile and an impossibly fast last mile even if you adjust for the kick. Anyway, I still remember where the right markers are enough to know when they are not where they are supposed to be, and the GPS ones were not. But I did not know the right marker position well enough to be able to take my splits. So I'll post the "official" marker splits with an adjustment guess. First mile officially 5:17, more likely 5:23. Second 5:29, probably about right. Third officially 5:56, more likely 5:50. Last mile 5:43, probably about right. I ran with Mike up to about 1.7, then the legs sarted to give out. However, I was able to make a last ditih effort to catch up to a high school runner whose name I have forgotten and latch on. He pulled me to a little bit after 3 miles, then I made a feeble effort to pass him, which he fought off, then with half a mile to go I put in all that I had into passing him and dropping him and was able to gap, but it was not enough to hold him off in the kick. Additionally Clark Nielsen outkciked me as well, but at least I did not get chicked like last year, and the time was 40 seconds faster in spite of much worse conditions. Of course, last year I was recovering from a cold and a foot injury as well so the comparison is not as good as it looks. Mike had a great race fininshing in 21:56. Who knows what that is worth. Based on workouts I was expecting him to run 21:10 in ideal (for Novermber) conditions, but I could have been wrong one way or the other. Danny Moody won with 20:45. Last year he did 19:38. 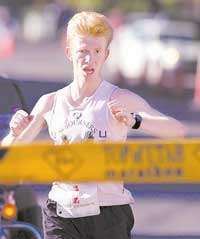 Amber Andrews won with 24:01 thie year vs last year's 23:02. Both of them are reasonably consistent performers, but not clock-consistent. But at least we have some baseline. Then it was time for kids races. They were full of adventure. First William ran 100 meters. It was too late when we realized his shoes had been left in a bag too far away from the start. So we borrowed the shoes from Jacob which were too big. those fell off once, I put them back on. He made it to the finish in third place in 1:12. That was not as good as Jacob's win in 2008, or Joseph's 46 in 2007, but not as bad as some of Benjamin's DNS' at that age. The challenge with William is that he does not talk much yet, so it is hard to explain to him what he is supposed to do, especially when it is 15 F temperature. He did quite well for the conditions. Next it was Jacob's turn. He was in the lead. Half way through Hawk gave me a hard time about holding his hand even though in the past the practice was that parents could hold the kids' hand in the 3-4 age group, and they did not say anything about that at the start. I let go, but Jacob still ran strong and finished in first place in 1:57 for 400 meters. Then Julia and Joseph ran in the 800 meter race. Julia chicked the field with 3:39, which pleasantly surprised me. She's been having a hard time holding pace in her training runs, so I was expecting her to blow up, but she did not. Joseph took 2nd in his age division with 4:17, which is about what I expected. He has the speed, but not the mental maturity, and if I could hold his hand to help him stay focused, it would have been around 3:45, but in the 5-6 age division you do not hold the hand. In any case, it was not bad given the cold temperature. The real adventure came in the mile race. They started it without warning, so whoever was at the start at that time got to start on time, and others had to run from behind. Benjamin got to start on time, while Jenny was about 2:30-3:00 late, which is an absulute disaster in the mile. Benjamin took 3rd with 6:09 after a 12-year kid whose name I do not remember and Aiden Troutner. Jenny's last quarter was 1:46, and her official time was 9:47 which was good enough for 5th place, but of course does not reflect her true fitness. A.M. Ran with Mike, then with the kids, total of 12. Benjamin did 3, Jenny and Julia 2, Jacob 0.5, and Joseph 1 mile. A.M. Ran with Mike. Cut the long run short due to indigestion. All places from 8;00 to 5:30 felt the same - miserable. Most of the run was at 6:40 pace. So ended up with 15.7 including 3 with Benjamin at the end. Jenny did 2, Joseph 1, Jacob 0.5. Julia had the same problem as me with the stomach, did not run.